LOS ANGELES (MARCH 12, 2018) — African-American men successfully lowered their high blood pressure to healthy levels when aided by a pharmacist and their local barber, according to a new study from the Smidt Heart Institute. Uncontrolled high blood pressure is a leading cause of premature disability and death among African-American men, who have less physician interaction than African-American women–necessitating community outreach. "When we provide convenient and rigorous medical care to African-American men by coming to them–in this case having pharmacists deliver that care in barbershops–blood pressure can be controlled and lives can be saved," said Ronald G. Victor, MD, associate director of the Smidt Heart Institute and the study's lead author. "High blood pressure disproportionately affects the African-American community, and we must find new ways to reach out so we can prevent strokes, heart attacks, heart failure and early deaths." The men were randomly assigned to two groups. 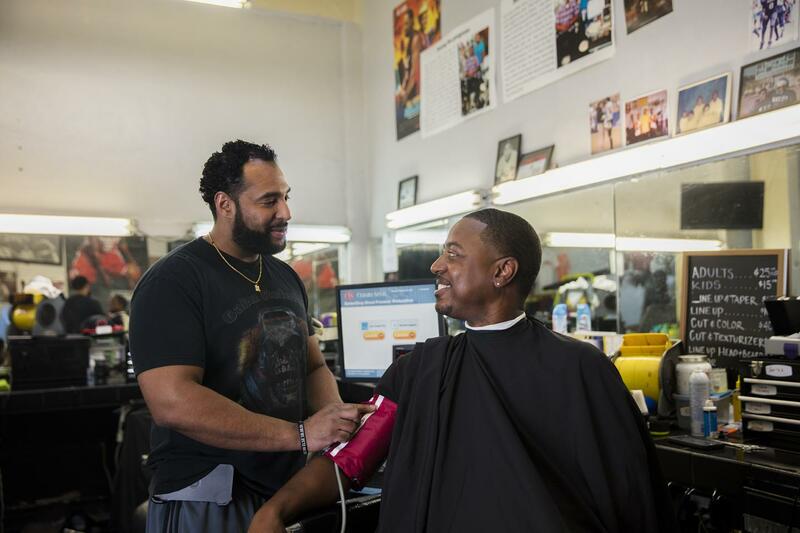 The first group's barbers encouraged patrons to meet with specially trained pharmacists who met the men monthly in the barbershop–where they prescribed blood pressure medication, monitored blood tests and then sent progress notes to each patron's primary care provider.